The aspiration to relate the past 'as it really happened' has been the central goal of American professional historians since the late nineteenth century. 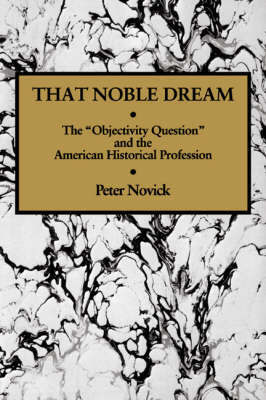 In this remarkable history of the profession, Peter Novick shows how the idea and ideal of objectivity were elaborated, challenged, modified, and defended over the last century. Drawing on the unpublished correspondence as well as the published writings of hundreds of American historians from J. Franklin Jameson and Charles Beard to Arthur Schlesinger, Jr., and Eugene Genovese, That Noble Dream is a richly textured account of what American historians have thought they were doing, or ought to be doing, when they wrote history - how their principles influenced their practice and practical exigencies influenced their principles.